Prominent & Leading Manufacturer from Rajkot, we offer plumbing pipes. Being a reputed organization in the market, we are engaged in offering Plumbing Pipes, which are extensively used as transportation of gases and liquid in industries. 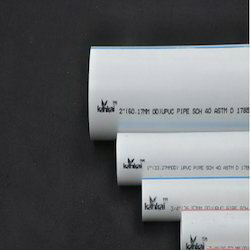 The offered pipe is manufactured making use of optimum grade unplasticized polyvinyl chloride and contemporary technology in synchronization with set industry standards. Looking for Plumbing Pipes ?